Masahiro Sakurai explains that "the villager and trainer were not choices we made for the sake of cheap novelty." When the debut trailer Super Smash Bros. for Wii U and 3DS aired during E3, it brought tears of excitement to many Nintendo fans. It was pretty awesome, and while the addition of The Villager was kind of strange, it ended with the introduction of Mega Man, which I don't think anyone is complaining about. 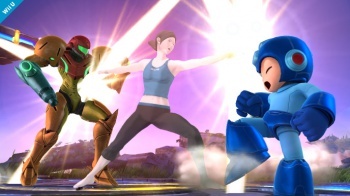 Directly after the trailer, however, the Wii Fit Trainer was announced as the third new character. This had quite a few people scratching their heads, especially considering someone's favorite character from Brawl was cut to make room for her. Masahiro Sakurai, talking to Famitsu, justified the inclusion of The Villager and the Wii Fit trainer, explaining that they "were not choices we made for the sake of cheap novelty." He says that "Each has their own unique attacks and battle strategies, and they make the game more interesting. If I have an image of a character in my mind that dances around and jibes with what I want, then that's the most important thing." "Even if you have a character suited for a fighting game, if you can't make him stick out from the pack and extract something unique from him, then what can you do?" Interestingly enough, Sakurai revealed that The Villager was actually a planned character for the previously released Super Smash Bros. Brawl, but was removed during the planning stages because "he wasn't suited for battle." Sakurai even delivers a subtle burn to another popular mascot fighter when discussing the addition of Mega Man. "For Mega Man as well, if all we cared about was who we could get in the game, then he would just have regular old punches and kicks, like how he largely does in the Marvel vs. Capcom series. But Mega Man's most unique trait is how he gains new attacks from bosses." All in all it sounds like Sakurai is a pretty clever dude, and is really trying his hardest to make this game the best it can be. Kudos for being so open with his development process, and explaining the reasons behind all of his choices.